The renovation of the existing rooftop bar consisted of the relocation of the bar, DJ area and increasing the kitchen size as well as giving the space a totally new identity. 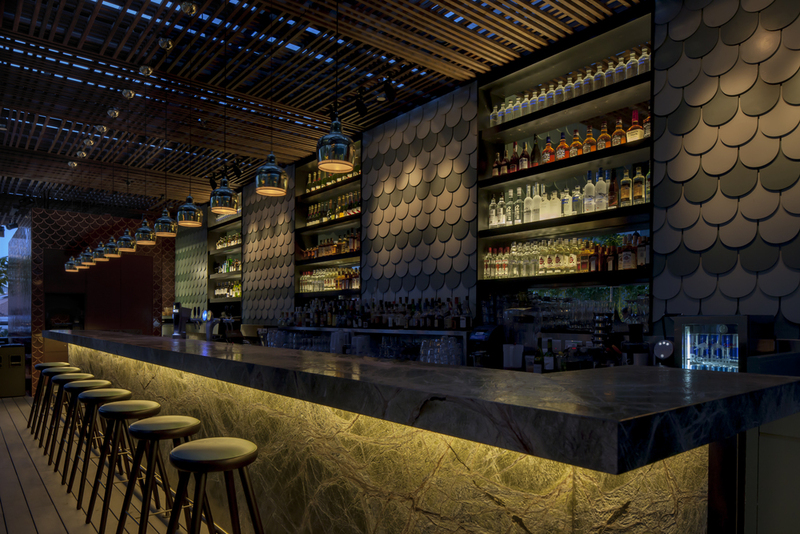 The space consists of a long marble bar, outdoor lounge seating and an indoor lounge area. We took the graphic roof-tile element and incorporated throughout the design. A green wall and extensive planting were also used to give a the roof an outdoor greenhouse feel. We added a stand-alone “Mama-Shop” inspired by local Singapore corner shops, rattan chairs, custom made bar stools and tropical patterned banquettes add to the outdoor back-yard feel.